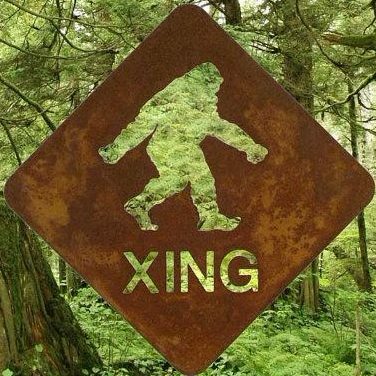 It seems to me that the Sasquatch people have been using me as a facilitator of late by talking about them to people of interest and opening the door of possibility for them. Today was another good example of that. I was in a favorite area today looking at the structures they often leave there. I suddenly saw a man Rick and his Labradoodle dog approach me and we started to chat. He started talking about deer and I asked him if he thought deer made the structures. Tongue in cheek of course. I found out that he frequented this place and he thought that the structures were made by kids or homeless people but he admitted that made little sense to him. His reasoning was that they would not provide even a modicum of shelter for a person along with the fact that they seemed to be changed or appear new almost daily. That and the fact that the campground we were in was closed and seldom visited by people at this time of year. Extreme rain and weather did not seem to deter their construction either. Nothing logical pointed to them being human made. As he was pondering these mysteries I told him that they were in fact made by Sasquatch people. He did not poo poo my comment and seemed receptive in fact. It was then that he told me a most interesting thing. Just moments before he came upon me he had witnessed something odd in the woods just yards from where we were. He described it as a big shadow and shape of what he assumed was a bear. It is worthy of note that we never see bears here at this time of year. It seemed to be hunched over and looking at him, trying to hide behind whatever cover was available. I am pretty confident I know what he saw and it was not a bear. We parted ways and he left with an open mind and a few suggestions I offered. I simply said say hello and tell them your receptive to connecting with them. I cannot begin to relate how many times I have talked about them lately only to find out that the person I have spoken to has experienced something related to them just a short time prior. Connections! A fascinating follow up to this account happened two days after I initially meet Rick. I returned to the same area and ran into him a bit further down the trail by a vast, scenic lake, tucked in between curious, mountain sentinels. We were in the exact area where he said he noticed that new structures appeared on an almost daily basis. As we continued our chat he pointed to one in particular and told me that it was new since last we talked. What was interesting about this is simple. After our initial talk I headed directly to where we were now to check out what he had told me about his findings there, and upon my arrival saw the structure he was now pointing out. It had shown up less than 15 minutes after we talked and was central to the area and there was no way he would have missed it. He was adamant that it had not been there and seeing that it was quite large and stuck out like a sore thumb I agreed that he could not have missed it. Rick was the only other person I saw the entire time there and the area in general was devoid of human traffic on this sleepy, misty, overcast day.